I can't believe it is October already, where has the year gone? This is one of my favourite months of the year. It is FINALLY starting to feel like autumn here in the Fraser Valley. Leaves are changing, the mornings are often cool with a little bit of crispness to the air and foggy. We've been lucky with the weather, it's been gorgeous, but I'm ready to ditch the tees in favour of sweaters and layers and all that other autumn goodness. The rush of back to school is over, the school year routines are starting to feel normal again, Thanksgiving, Halloween, our anniversary.... so much wonderfulness to October. Speaking of school year routines and normal, this year has presented a few challenges all ready. Especially mornings. I'm not a morning person. I want to be. I want to be that person who's up with the sun, enjoying a quiet cup of tea or coffee as I welcome in a new day. I'm too much of a night owl though. Since I don't have that extra hour or two to get a jump on the day, I'm really working at trying to make our mornings flow smoothly, and not feel so frantic. After much pondering and surfing around the wonderful blog communities and the internet in general, I've come to the conclusion that our mornings would be much better, if I was managing our my time better throughout the day. It's been working quite well, as it is, but it's need a little help. 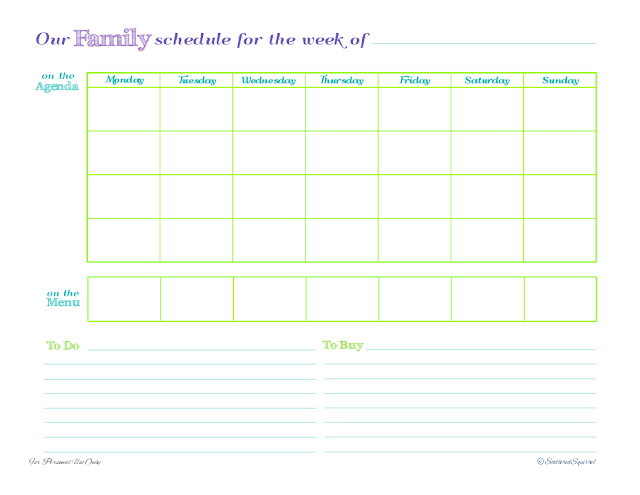 (or I need a little more help) I wanted something that could keep track of everyone's activities, where I could have a visual for the meals for the week, and I needed something located near here to keep track of general To Do's and also items we're running low on. Nothing worse than forgetting the milk is running low and not remembering until the next morning when the boys are wanting it for their cereal. And I decided I wanted to have all this on the fridge. I used to keep a similar system on the fridge at our old place, and it worked well. I'm in and out of the fridge all day, having important info, reminders, and the like in a place where you will look at it often is a great way to stay on top of everything. I just didn't want to have a bunch of stuff on the fridge. It gets cluttered enough as is. The solution? Here's how I'm using it: Each member of the family gets their own row. That way I can see at a glance what's happening that week and for who. 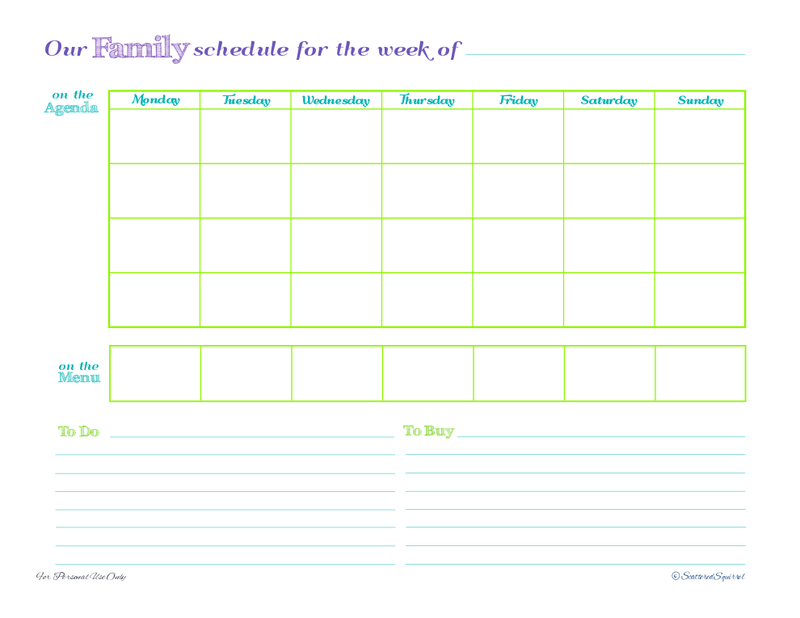 Our teen can keep track of any homework deadlines for the week, so that we can make sure he meets them. (He doesn't usually need us to remind though) And I'm pretty sure I don't really need to explain the rest. I still have to get the colour printer set up, (it's been sitting for a few months, and I think it's almost out of ink too, which means it's going to need a cleaning before I start printing with it... and ink come to think of it!) so for right now, I used our black and white laser one and stuck it in page protector. Once I get the colour printer up and running, I'm going to print it onto photo paper, and either laminate it, or put it in a lightweight frame for on the fridge. Hopefully this will help me not forget things so much. I can see what's happening tomorrow as I'm putting away the leftovers, and prepare for the morning the night before. No more rushing to get breakfast ready, lunches made, make sure library books are in backpacks for library day.... I'm looking forward to more smoothly run mornings! Awesome planner, that's gotta be super useful! Thanks for sharing at The Fun In Functional! Looks like a great system - glad it's working for you. Thanks for linking up at Romance on a dime!! Thanks! I'm hoping it will help keep us more on track. 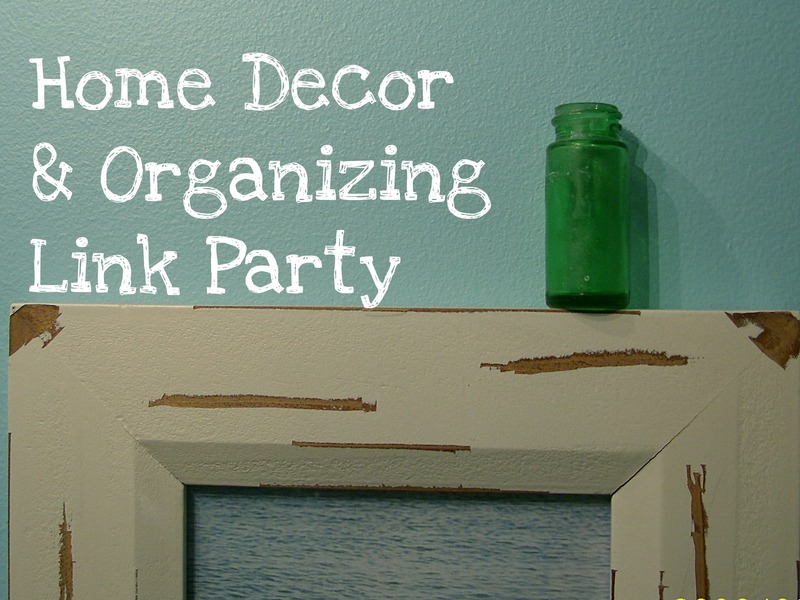 Thank you so much for hosting your link party. I think I've doubled my reading list since finding your blog. 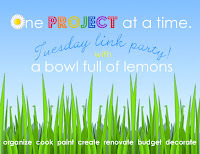 Thank you so much for hosting the link party. I have found so many wonderful ideas, and discovered so many new bloggers to follow. I'm totally enjoying your 31 day series!